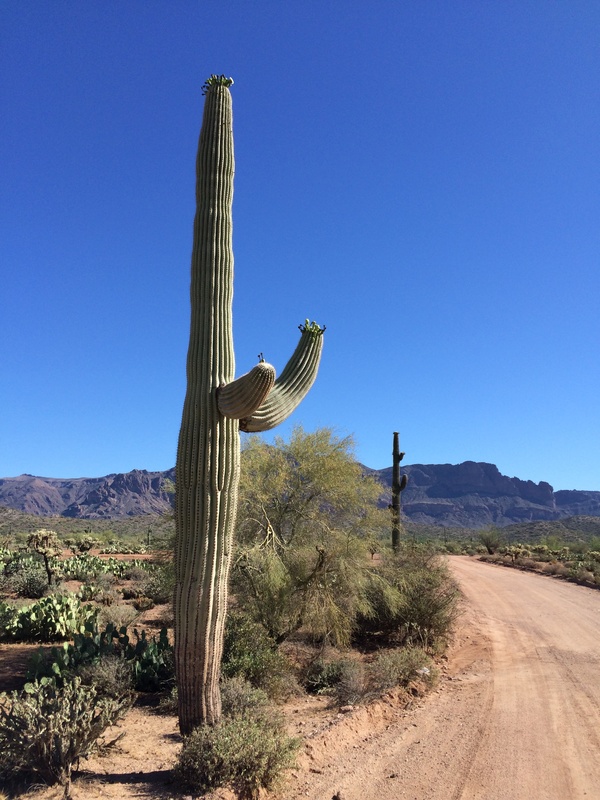 OK, I have to point out that spring 2015 has been relatively wet and cool in Arizona, and the desert seems especially bountiful everywhere. Even in a dry year, though, this route would be impressive. Think movie-location beautiful. 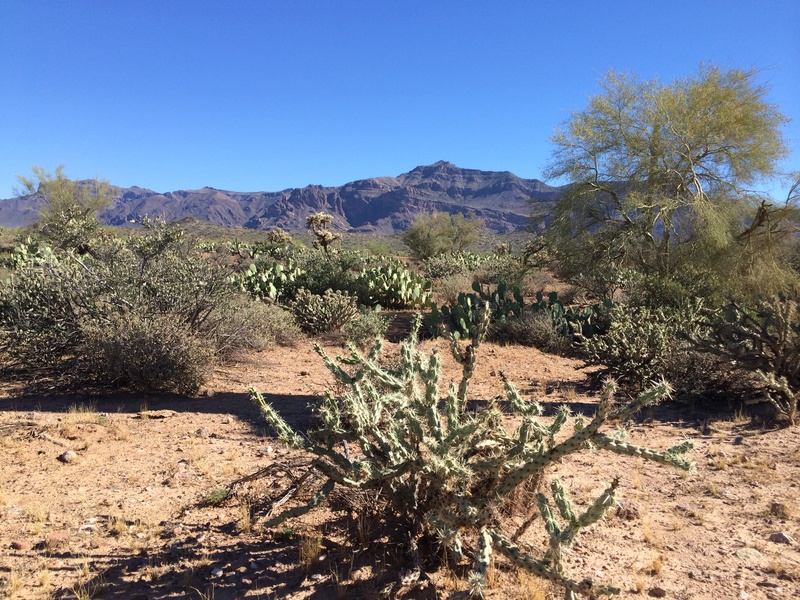 By the time I arrived at the trailhead for the Peralta Trail, it was already 8:30 a.m. On any other June weekend, that probably would have been too late to start a desert hike. But this Sunday, the temperatures were mild; the thermometer in my car registered a doable 82 degrees. Actually, the lateness in the morning and the season probably helped to keep the crowds away. 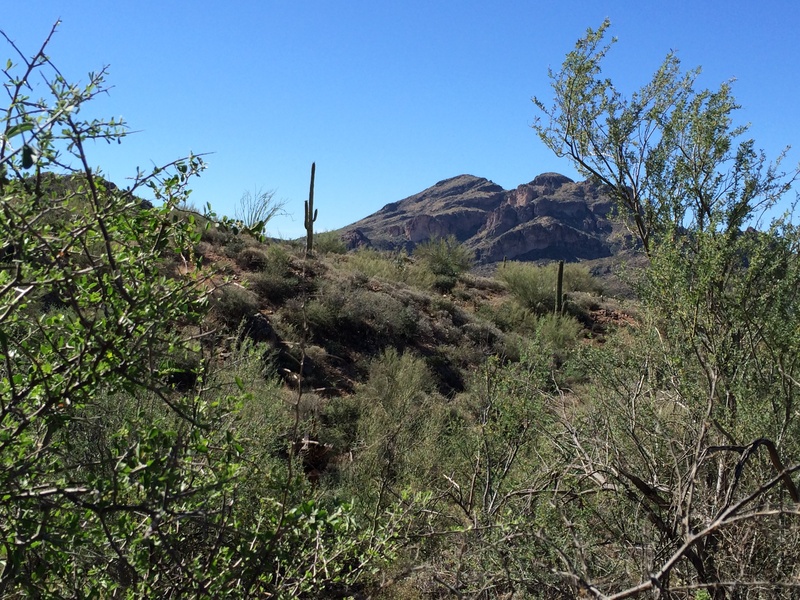 As I learned later, the Peralta Trail is not exactly a secret in the Phoenix area. Online reviews note that the trail can get very crowded on winter weekends. As it was, I had the trail almost to myself. 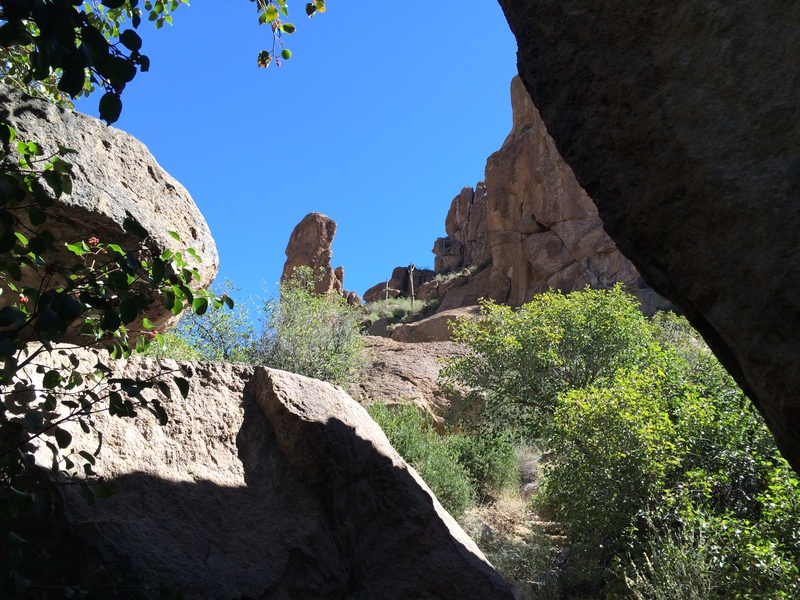 I ran into three or four other groups of hikers – just enough to keep the route from feeling totally deserted. Once on the trail, I was delighted with the variety of terrain. 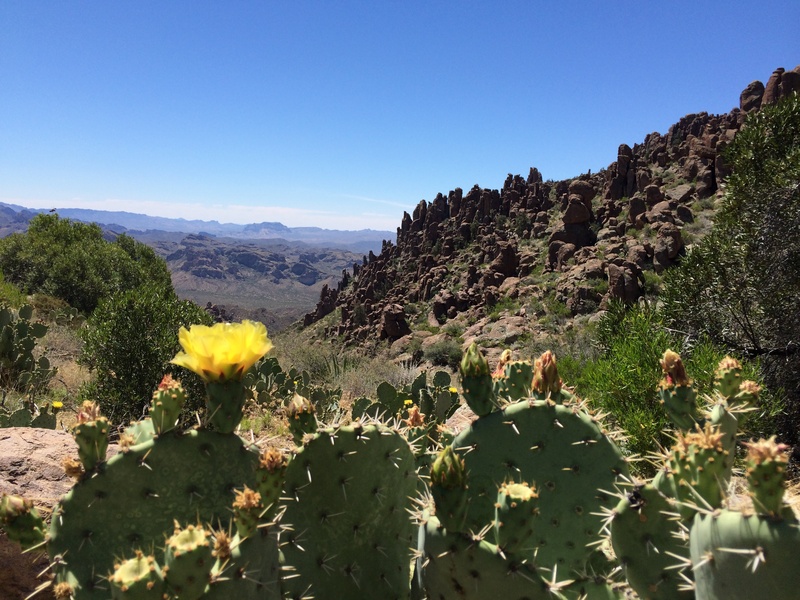 One minute, you’re passing through creek beds shaded with lush greenery, and the next, you’re climbing over huge boulders lined with spiky cacti. I decided to hike to the Fremont Saddle, which is about two and a half miles one way. 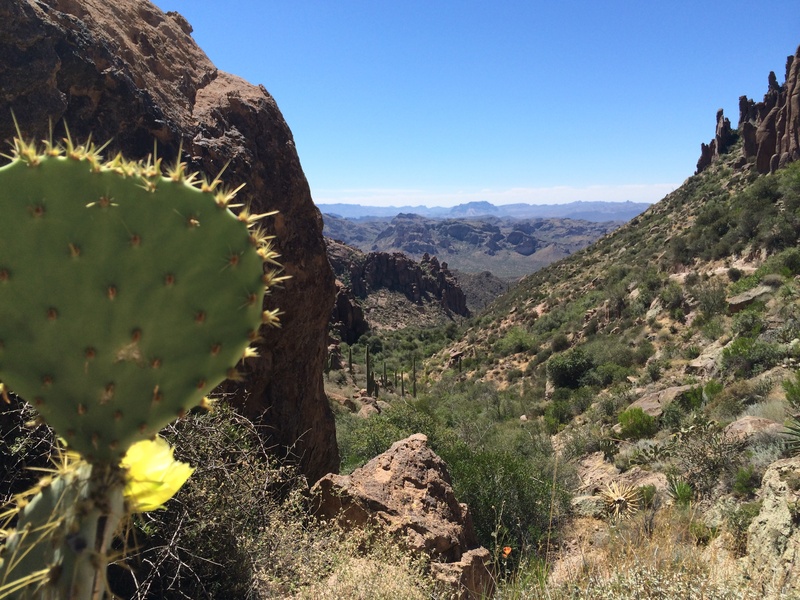 The trail rises about 1,400 feet, so the climb is fairly constant. It didn’t feel terribly steep, though, and the scenery keeps your mind off the grade. And once you get to the saddle, it all becomes worth it, anyway. 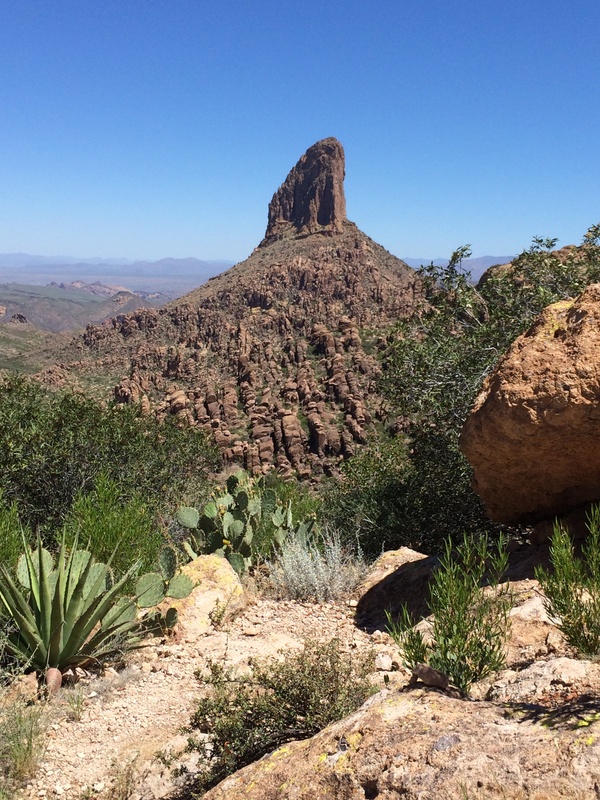 Weavers Needle – prominent in the legend of the Lost Dutchman’s Gold Mine – veers up suddenly as you turn the final corner. I had known it was coming, and it was still an “OMG!” moment. At 1,000 feet high, the thin, tapered needle stands alone in the distance. After sitting in awe for a time, I headed back down through the canyon – to a whole new perspective on what I had just traversed. The photo opportunities are so plentiful that you could spend hours getting various shots of the canyon. And be warned, the trip down was taxing in its own way. 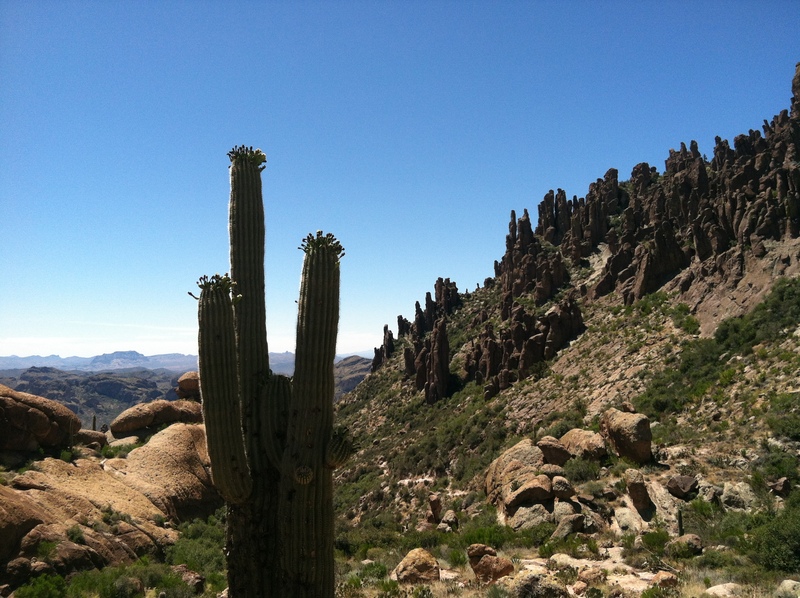 By late morning, the temperature had risen to the low 90s, and the rocks in the trail were tricky on the descent. Regardless, though, the hike is worth the work. 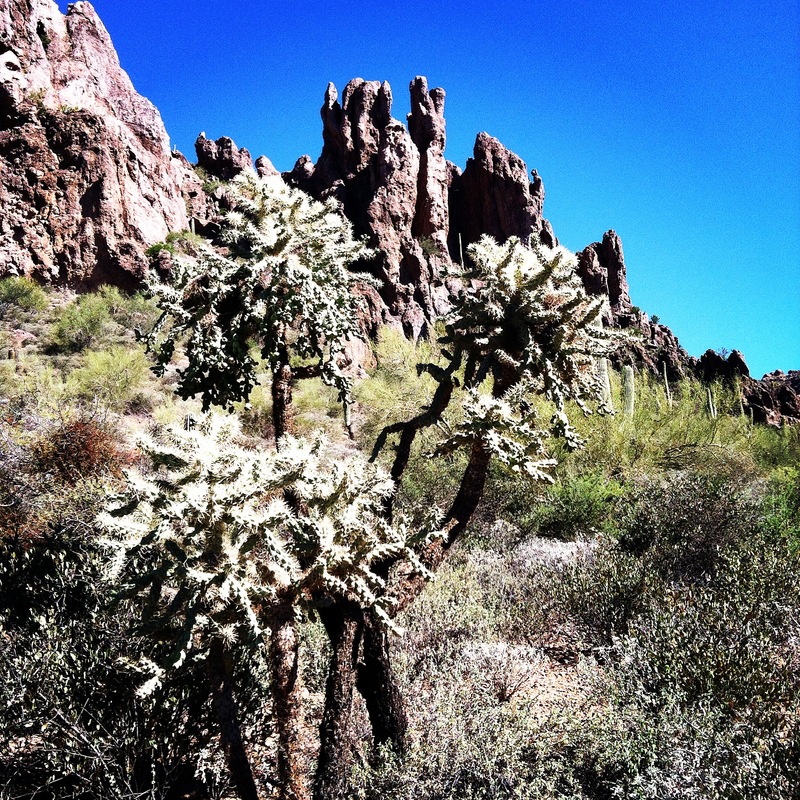 If you need a little refresher course on the charms of the desert, this might just be the spot to get it!